Over the last three weeks, College FootBlog has provided preseason power rankings for the ACC and Big Ten. Earlier this week, College FootBlog broke down the SEC East (see link). The SEC has been known for being the best conference in college football, and for good reason–the last two national champions have come from that conference. We now take a look at what we expect from the much deeper SEC West Division. 1. Alabama: Even though the tide lose several key defenders including both starting corners and All-American linebacker Rolando McClain, head coach Nick Saban has more than enough talent to put another sound defense on the field in 2010. People outside of Tuscaloosa will know the name Dre Kirkpatrick after this season. The sophomore corner has the size (6’3″ and 190 lbs.) and skills to be the Tide’s next All-American defensive back. On offense, Bama has the top running back tandem in the nation with Heisman Trophy winner Mark Ingram and sophomore Trent Richardson, who rushed for over 100 yards and two TDs in last year’s BCS National Championship. Wide receiver Julio Jones will be an NFL first rounder next spring if he chooses to leave early, and quarterback Greg McElroy enters this season with big-game experience. The running game and Saban’s ability to coach up the defense make the Tide the front-runner to not only win their division, but also challenge for another BCS National Championship. 2. 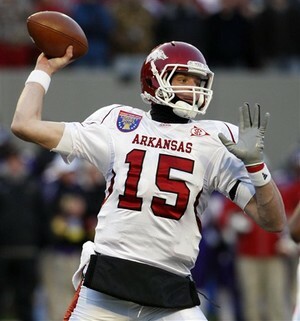 Arkansas: As quarterback Ryan Mallett goes, so will the Razorbacks. Mallett, who goes 6’7″ and 238 lbs., should only improve his draft stock by sticking around another season in Bobby Petrino’s offense. The Heisman hopeful will look to build on last years numbers of over 3,600 yards passing with 30 TDs compared to only seven picks. Defensively, the Hogs must improve and a couple of new coaches on that side of the ball and the return of cornerback Isaac Madison, who missed last season due to injury, should help a secondary that finished 99th in the nation against the pass, giving up just under 250 yards per game through the air. 3. LSU: Les Miles will have a pretty young team, but he has recruited extremely well. The Tigers must replace a couple of key weapons on offense, including WR Brandon Lafell, but they have a stable of big, physical receivers like 6’5″ Terrence Tolliver and and 6’3″ Rueben Randle. Quarterback Jordan Jefferson must be more consistent this season, but with a full season under his belt and the talent he has at WR, he should take a step forward this fall. Stevan Ridley looks like he will take over the starting running back spot with the departure of Charles Scott, but the Tigers will split carries among a few running backs. Defensively, LSU lost two-sport star Chad Jones, but they have some decent depth and athleticism in the secondary, including freshman safety Craig Loston. The schedule is not in LSU’s favor, though, as they go on the road to face Auburn, Florida, Arkansas and North Carolina. 4. Auburn: Head coach Gene Chizik silenced all who criticized his hiring from lowly Iowa State in last year’s off-season. The new head coach led the Tigers to an 8-5 record and gave Alabama all they could handle in the Iron Bowl before losing to the Tide 26-21. On offense, the Tigers return running backs Ben Tate and Onterrio McCalebb and four of their five starters on the offensive line that combined for the nation’s 13th best running game in the country in 2009. Add to the mix, junior college transfer quarterback Cameron Newton and a deep and talented receiving corps, and Auburn could easily move up the power rankings in a hurry this fall. Defensively, the Tigers gave up 30 or more points in seven games last season. That must change if they want to challenge Bama for the SEC West, but Chizik is known for his defenses, and with a year under his belt and another solid recruiting class should provide much better results this fall. 5. Ole Miss: Although quarterback Jevan Sneed did not perform well last season, throwing 20 picks, he was still a leader on a Rebels’ squad and replacing him will be easier said than done. 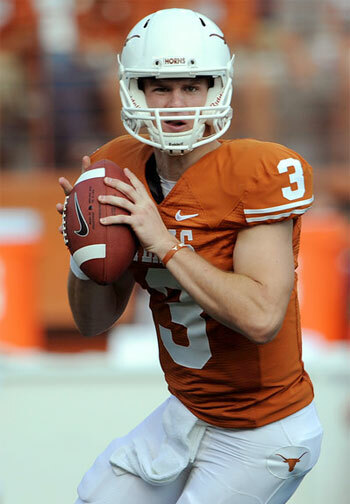 Whoever assumes the starting job at QB will be inexperienced and unproven. By far the biggest hit on Houston Nutt’s offense, however, is the graduation of do-everything RB/WR Dexter McCluster. The Rebels’ defense, along with the electric play of McCluster, was what kept them in games last season, and the good news for the fans in Oxford is that several key defenders, including mammoth NT Jerrell Powe who weighs in at 340 lbs. Powe will attempt to lead another top 25 defense, like the Rebs’ fielded last season. Even with a stout defense, the key losses on offense will prove very difficult to overcome, and staying afloat in what is probably the toughest division in all of college football (SEC West) will probably make a .500 season a difficult task. 6. Mississippi State: Second-year coach Dan Mullen will have his work cut out for him again competing in this division. The Bulldogs lose their running back from last season, Anthony Dixon, and that loss will hurt. Robert Elliott is the front-runner for the starting RB spot, but replacing 1,300 yards will be difficult to pull off. A major reason for the Bulldogs’ 3-5 SEC record from last year was their pass defense, which was 11th in the conference. It doesn’t help the Bulldogs that instead of Vanderbilt this season, they pick up Georgia. Coach Mullen should have an improved product on the field this season, but that will not necessarily translate into a better SEC record in 2010.